The African Development Bank (AfDB) convened a 3-day Civil Society Forum (CSF) themed “Engaging Civil Society in Accelerating Africa’s Industrialisation”. This year’s theme was framed based on the realisation of the expanding role of Civil Society in Africa and the increasing importance of multi-stakeholder engagement. We were glad to have been a part of the discussions to shape priorities on the continent across various thematic areas- Energy Access, Youth Unemployment, Agriculture based inclusive industrialization and Social Innovation. The sessions were insightful across the board, especially in learning of the AfDB’s perspectives and strategy for industrialisation; lessons shared and resounding recommendations from practitioners to the Bank and policymakers across the continent. It was a great time connecting with other CSO players across the continent, exploring opportunities and forging more areas of collaboration. A major highlight of the conference was the capacity building workshop on the emerging ecosystem of Social Impact Entrepreneurship where we shared our lessons and experiences from our Social Innovators Programme. 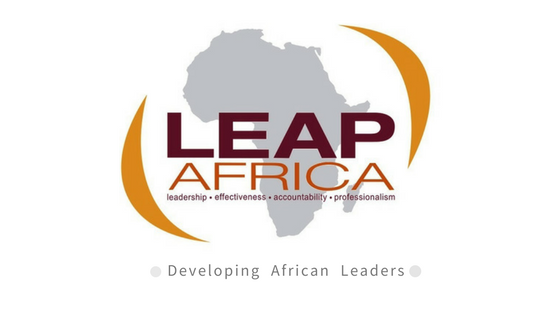 In 2008,I came in contact with LEAP Africa prior to a Youth Leadership Training hosted in Port Harcourt. Being passionate about youth development,I volunteered to mobilize my undergraduate students to the training.I am always excited,years after graduation,they still call to appreciate for attending LEAP Africa training !! !LEAP Africa is growing stronger and bigger!! !Please keep it up !!!! This is great to hear. We would like to hear more about their progress. Can you link up with us via email at info@leapafrica.org? LEAP ENTERPRISE: Providing technical supports to states in the Southwest on ease of doing business.